Crista is an energetic, passionate and engaging person that others can really relate to. Audiences love her raw honesty and unique sense of humor, combined with her creative and direct delivery. She brings her personal experience as a mom, an entrepreneur and a leader in her industry to each and every presentation. Crista tells her story in a genuine and innovative way, inspiring anyone who experiences it. Crista Tharp is the CEO of Blissfully Simple Events, founder of Blissfully Simple Wedding Planning, and creator of the Blissfully Simple Wedding Planning Business System. She has worked in the wedding and event planning industry for more than 17 years and has authored 11 books, designed more than 800 events, and spoken at numerous conferences and workshops. In addition to being published in hundreds of magazines and blogs, Crista has appear numerous times on Fox 59 as their expert wedding planner. She was chosen 2 years in a row as a wedding industry expert - a designation given to only 50 people world-wide. Crista’s fresh outlook and upbeat attitude make her one of the Midwest’s most sought after wedding planners and speakers. 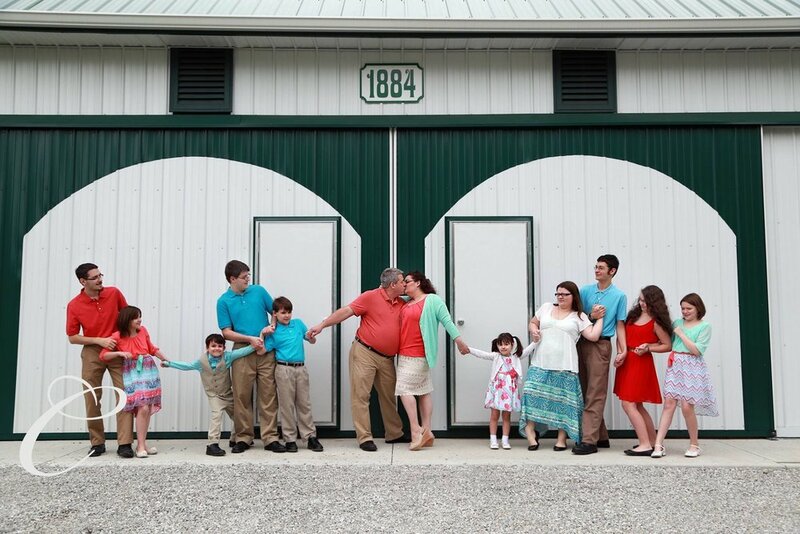 Crista lives in Kokomo, IN with her stud husband, Chad and her amazing children, Mathew, Jordan, Terin, Julia, Rebecah, Elijah, Ava-Elisabeth, Gabriel & Catherine-Anne. Yes, 10 children - all Theirs! Everyone struggles with daily issues that can consume his/her life. The pressures of maintaining a household, juggling work and family, cultivating meaningful relationships, and the financial pressures and demands of today’s economy can take their toll. Crista shares the secrets she discovered while taking a year as an experiment to live amerced in the power of positive thinking. Through faith, life application and extensive research, Crista has a newfound freedom that has changed her life and will change your life by applying her simple and powerful techniques. Everyone is looking for the magic pill or secret formula when it comes to business success. We have been told that nothing like this exists – but this couldn’t be farther from the truth! Crista walks you through the FELICITY Philosophy ™ and the proven strategies she has taken to transform her small wedding planning business into an international Brand. Even better, she shows you how you can do it too! How to Tell a Wedding Planner She’s Wrong…and Live to Tell About it! The wedding industry is full of experts and often there are conflicting opinions on how something should be done. This talk is designed for all non-planner wedding vendors and will show you how to stand behind your position, get the best for your client while maintaining great relationships with your fellow vendors (even with wedding planners)! Crista will help navigate you through the murky waters of creating, fostering and leveraging the critical relationships you MUST have in order to be the best in your field – and keep them referring you. When wedding planning has become the fastest growing career in the world, how do you set your business a part from all the competition constantly flooding the market? Blissfully Simple ™ Wedding Planning is quickly becoming the Gold-Standard that both Brides and planners look for. Crista details the phenomenon behind Blissfully Simple ™.